As far back as he can remember, Jack Carlyle always wanted to be a hockey player. Growing up in Sault Ste. Marie, Ontario, while the rest of his friends were off to the rink, Carlyle wound get dragged onto the Hiawatha Nordic Ski Trails, where he would shuffle around the snow on cross-country skis. “I wanted to be a hockey player so bad. Ninety-five per cent of my friends played hockey. It was a totally different world I just wasn’t a part of. My parents didn’t want to put me through that for a multitude of reasons, so they put me in skiing when I was really young and hated it with a passion. I did not like to get up early to go to the trails in Hiawatha ” Carlyle said. Yet those hours spent in a supposed waking nordic nightmare eventually led the 23-year-old to Norway, where he is now chasing some of the best skiers in the world. Carlyle discovered his incredible endurance made him well suited for cross-country skiing, and snuffed out his Stanley Cup dreams. 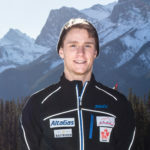 Carlyle is now in his third year with the Alberta World Cup Academy high performance training centre in Canmore, Alberta, where he frequently skis alongside Canadian national team members, chasing his goal of reaching the Olympics. Following a stint as a competitive swimmer, the lanky distance specialist took a circuitous route to Canmore. Training in the Canadian Rockies under the guidance of retired Olympians Chris Jeffries and Scott Perras has breathed new life into his career. He’s posted several promising results since making the move. Carlyle earned a trip to the U23 World Championships last season in Romania, where he posted a 32nd place finish in the 15 km skate. He followed that up with a pair of top-ten finishes at the Canadian Ski Nationals in Whitehorse, before heading to Europe in late November. Travelling with a crew from Ontario’s Team Hardwood, Carlyle wants to catch the eye of National team coaches and gain valuable race experience in Europe. “I really want to score some world cup opportunities. I think I can achieve that. Going to Norway and racing Scando Cups will be a great experience,” Carlyle said. With fewer than 500 days to the Pyeongchang Olympics, Carlyle said he’s allowed himself to dream about donning the Canadian red and white race suit, but has no desire to simply be a sport tourist. He wants to battle for a medal, which means 2022 might be his real target. “I’d be lying if I said I didn’t think of the Olympics. The Olympics are a goal. But I want to go and compete, not for the sake of just going to the Olympics. I don’t want to be a participant,” Carlyle said. Eighteen years after those miserable first ski days, it finally sounds as if Carlyle likes skiing. Carlyle’s first Scando Cup race of the season is scheduled for Dec. 10 in Lillehammer, Norway.